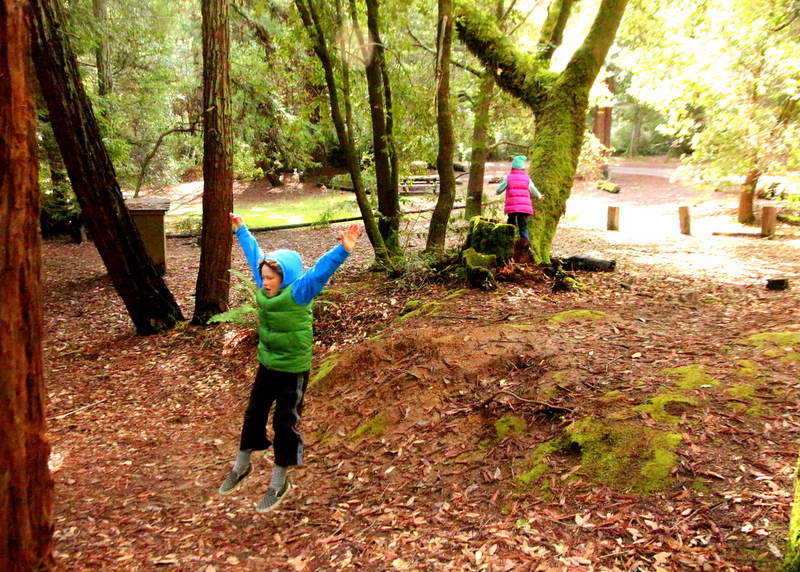 We left Casini Ranch on a beautiful sunny day and headed to the damp, cold forest where we would have no hookups and no reservations for the first time ever. Sounded like a good idea right? We checked our battery and after being plugged in a weekend at home and both days at the ranch thought we were ready for 2 days off the grid. Boy, were we wrong. We headed up 128 N through the beautiful Anderson Valley. Lovely downtown and cute vineyards if you have a little extra time. 128 is scenic but parts of it were a bit white knuckle for us, lots of steep inclines and windy switchbacks. Hubby has gotten very good at finding spots to pull over for those behind that don’t appreciate the slow travel of a trailer. We arrived at the park at 5pm. 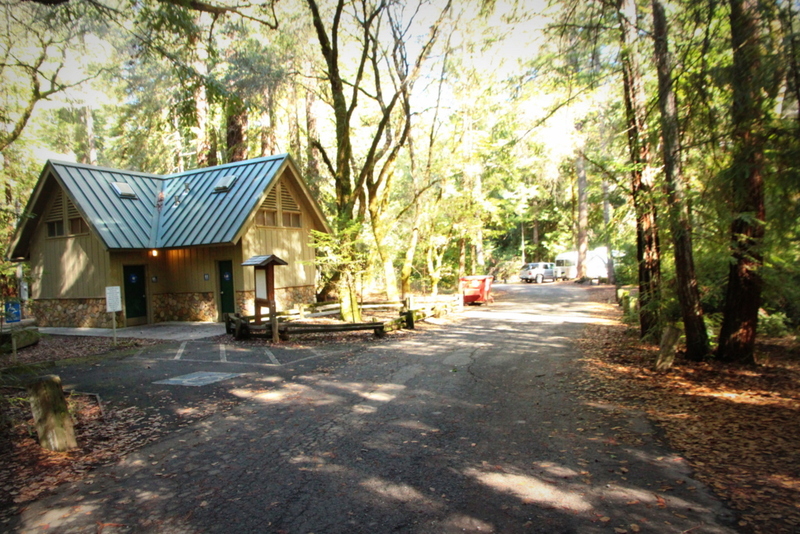 The ranger station was empty, visitor station closed, and no camp host. There was only one other camping family staying in one of the little cottages. We got the low down; ranger was out sick, visitor station closed for the week, notes on the camp host board about how to check in, and the showers worked; 4 quarters would buy you 5 minutes of hot water. The only other family in the park was leaving in the morning. We were a little unsettled about being the only ones camping all alone in the beautiful forest but decided it would be okay. We stayed on the Azalea loop right across from the newest bathroom. The other camping loop was closed due to the fact that most people did not camp in winter in forests. We had no reservations, just picked a site and paid cash for our spot and then took the dog for a walk and checked out the campground. 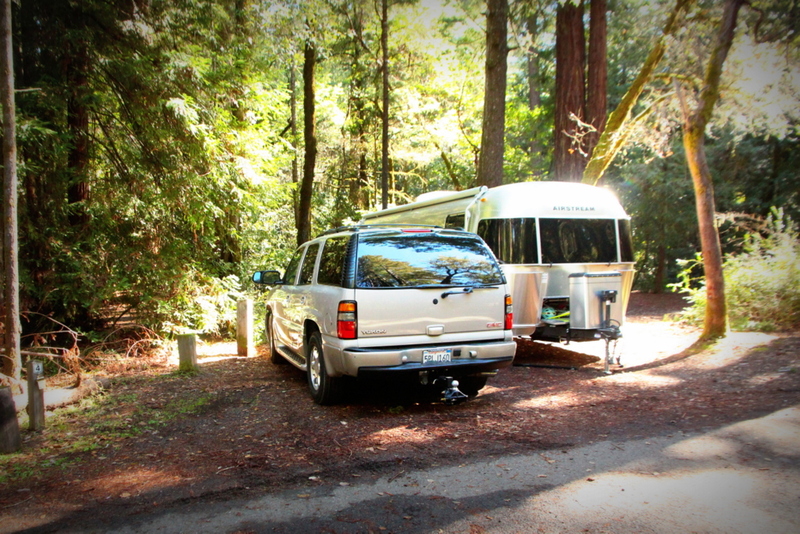 The campgrounds are lovely. The roads are wide and newly paved and the trees provide nice cover in summer weather. The sites are a nice size and fairly level for CA with a table and fire ring. 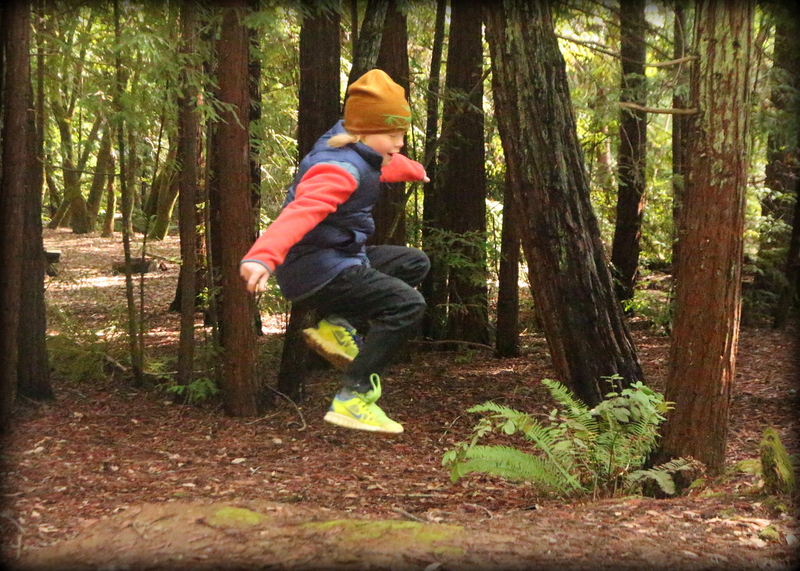 The trees are covered with moss and there are a few redwoods spread throughout. An owl swooped right over head and even Lady was quiet in awe. There were 2 bathrooms and plenty of great sites but in February it was cold, the kind that seeps right into your bones. We headed back to the trailer and discovered our electric was dead which meant our refrig. was gone too. Salvaged what we could for dinner, propane was working and we had camping lanterns. The kids loved it. Eating by lanterns, just like tent camping. We got ready for bed but it was already so cold in the trailer. We made up one bed for the kids for warmth and had them in ski jackets and hats with as many blankets as we could. Hubby and I did the same with Lady snuggling between us. Even she was cold. In the morning we decided to stick with our plan, leave the forest for our day adventure and suffer through one more night of freezing cold. Lady and I investigated both sides of the campgrounds on our walk, we ran into another family of five from Southern CA that came in late last night. They were planning on staying one more night too but we noticed they were gone after we got back from our day trip. No showers that morning, we packed our day bag with our lunch and extra gear for kids and dogs and headed out. Fort Bragg was our next stop. 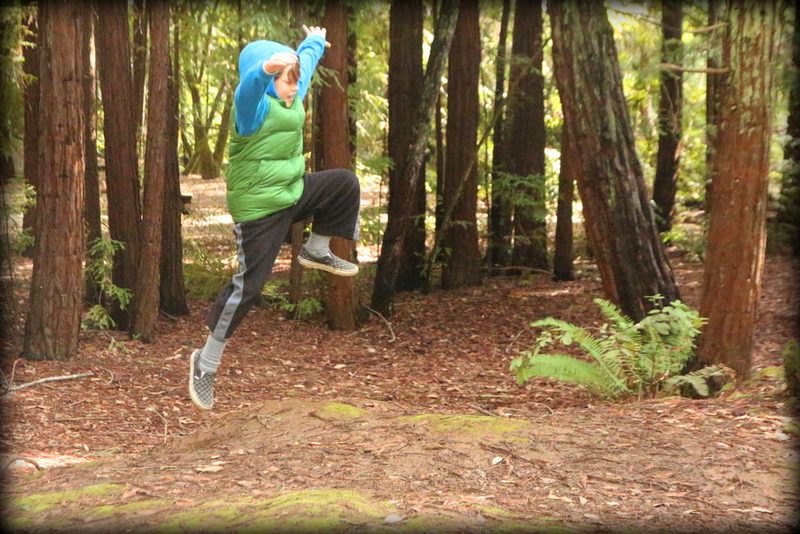 The kids had a blast having the campground all to themselves. They ran through the campgrounds and rode their scooters on the campground loop while we packed for our day trips and hitched to leave. We didn’t make it onto any trails in the park as dogs weren’t allowed. We probably could have taken turns with Lady, but frankly we were so frozen, we couldn’t wait to get out for the day to the sun. We used the showers on the last day. I was never so grateful or appreciative for 5 minutes of hot water and the chance to be warm and clean as I was that morning. I would love to come back to this campground. Maybe not during peak summer season and definately after we get the dry camping figured out. Ah, small hiccups make for the most rooted memories!